On Sunday afternoon Amy and I found the biggest broccoli crown we’d ever seen at the “Soviet” Safeway on 17th Street NW. This was huge. It was like a baobab tree. I have added the Empire State Building to the large photo to give you an idea of scale. 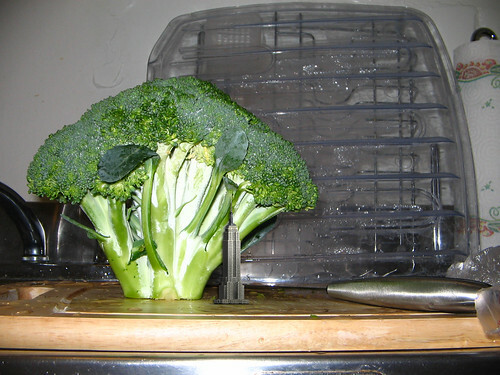 Based on this visual comparison you can see that this broccoli is at least 2700 feet high at its peak, possibly even rivalling the projected height of the Burj Dubai at its completion. Anyway, it’s all gone now. We ate it with chicken adobo and rice, and slices of stalk in veggie ranch dip. The whole crown lasted us through three dinners for two. I love broccoli. I’ve never been more frightened at the sight of a vegetable. That was an obscenely massive broccoli!